The MURS 151-XT system helps you increase your snack bar sales and customer satisfaction at the same time. 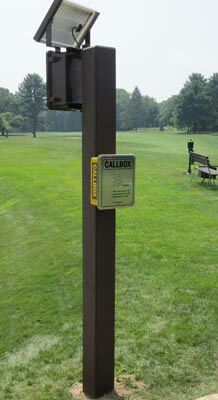 This durable two-way golf course ordering system enables golfers to order concessions while still on the course. Orders can either be delivered by your food or beverage cart, or they can be ready and waiting when the golfers finish their game. Not only does the wireless ordering system increase sales, but it also speeds up play on the last nine holes since golfers want to get to their food. Everyone wins with this system. The golfers are happy because they don't have to wait for their food, and you're happy because your profits are increased. The Callbox is the same as our MURS Callbox Outdoor Intercom. It is a virtually indestructible stainless steel and fiberglass housed outdoor intercom that can be battery or AC powered. 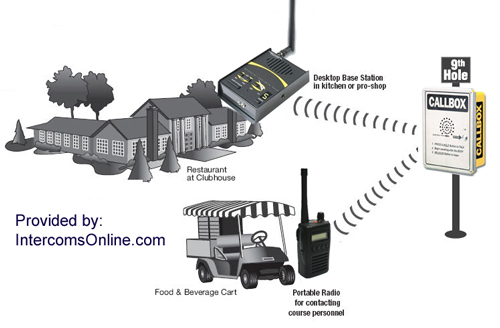 To increase safety of your golfers and employees, the base station intercom and handheld units both have NOAA Weather Scan, which aids in early detection of adverse weather conditions. Safety of your golfers is also improved since the Callboxes can be used to request emergency defibrillator deployment from anywhere on the course. Installing the MURS 151-XT Wireless Ordering System is a quick way to have golfers preferring your course over others in your area. Batteries good for one year or up to 1,000 transmissions when used in Automatic Turn-Off mode.